Island Yoga is an Ashtanga system of yoga practicing that incorporates the workings of the modern body, with the amazing ancient system of yoga. The Island Yoga-style of asana helps the yoga practitioner get in touch with their inner-self and build prana energy to help the yogi reach their potential. Island Yoga was created to power the people of the world. To help people get in touch with themselves, so they can go out into the world, and bring the super wonder of their adventure to the world. 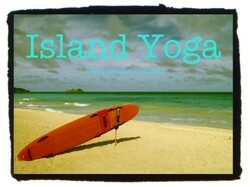 Island Yoga builds strength, and mana to live fuller, be better, and bring bunches of Aloha to the world. Island Yoga was founder by Eric BVD. Eric BVD leads a yoga practice of island style yoga that awakens parts, senses, and beings in one’s existence that aid in the inhabiting of the physical form. His teachings brings into focus the state of being and allows the practitioner to grow into the true potential of their being. Yoga sharpens the tools of existence, the mind, body, and spirit to allow the practitioner to better serve their fellow cosmic energy forces. Yoga is the path to experiencing the true wonders of the privileges of being. Eric BVD grew up on the island of Oahu in Hawaii, where he lived an active outdoor lifestyle. Doing handstands with the help of the shallow beach ocean was one of his favorite things to do. Eric discovered yoga while at college in Las Vegas. He started attending classes regularly at It’s Yoga, Las Vegas. After many years of practicing the rocket and primary series, his LV inspiring teacher Maggie Verderame told Eric it was time for him to study with the ‘Yoga Man’ Larry Schultz. Eric travelled to SF and committed to It’s Yoga, San Francisco teacher training. At the end of the program, Larry Schultz suggested to Eric that he move to San Francisco and continue training with him. After moving Eric continued to study and learn from It’s Yoga system, began teaching yoga around the city of San Francisco. Crow pose (Bakasana)This Arm Balancing Pose is the foundation of most hand based inversions. Great resource for yoga info.